When it comes to creating engagement at meetings, there are myriad new formats and content options one can explore and implement. But sometimes it pays to just get down to basics: seating. 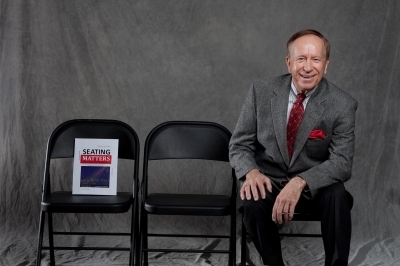 One person who’s been doing that for about 35 years is Dr. Paul O. Radde, author of Seating Matters, the definitive industry tome on how to make sure your attendees have that most basic of tools to truly be connected to whatever programming is being presented. Radde also presents a session titled “The Architecture of Engagement” to meeting planners and meeting facilities professionals. According to Radde, common assumptions regarding traditional seating sets can often be incorrect, such as rounds creating engagement opportunities. In fact, having a room set in rounds or crescents—especially rounds greater than five feet—can create numerous “pinch points” that hinder speaker interaction with an audience. “If you face each seat toward the presentation, then people are able to point their nose right at it with both ears functioning,” Radde said. Radde recommends using rectangular or square table setups in many instances. Set the rectangular table with the narrow end pointed toward the presentation, in a sunburst pattern. This allows attendees to flow in and out easier and also talk to everyone at their table without pumping the decibel level. This configuration also allows for more-efficient note-taking and laptop use, with all of their incumbent wires that can clutter the environment. Seating Matters can be ordered via Amazon or Radde’s website, www.thrival.com. "We have never had a keynoter who customizes as much as you did."